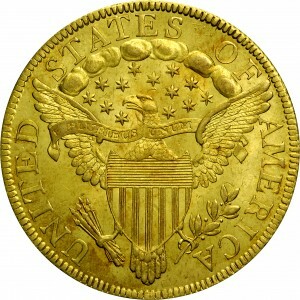 Three varieties of 1797 Heraldic Eagle ten-dollar gold coins are known, all from a single obverse die. Emission sequence of these varieties, therefore, is based on die states of the obverse. 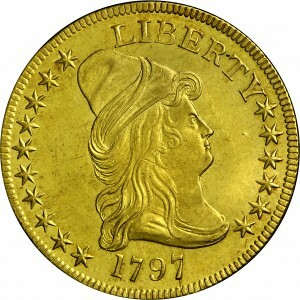 In addition, one of the three reverse dies was also used with 1798/7 obverse dies, thus extending this die linked group. These coins exhibit an interesting contradiction, with 16 obverse stars and just 13 reverse stars. 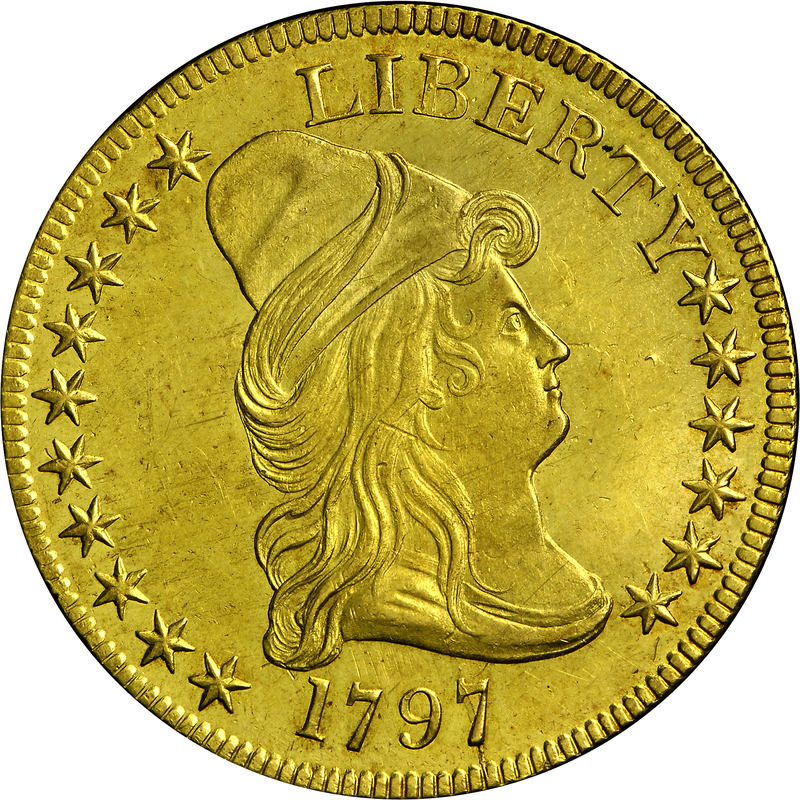 Approximately 125 examples of this die marriage are known, with a small number being Mint-State examples, including this Bass Collection coin. From the Bowers and Ruddy Galleries sale of the Fairfield Collection, October 1977, Lot 1785. "Obverse: Stars 10+6. Stars have normal points; in particular, stars 9, 10, 16, which progressively have their innermost point shortened by lapping when later muled with reverses B and C. Two cracks from edge to right side of base of 7. Left crack continues only to lower serif of 7. The right crack, with die crumble evident, now continues thru top serif to bust. Vertical die line below right arm of T. Reverse: Heraldic eagle, long narrow neck above and below motto (distinctive). Eagle has long, thin, attached tongue. Lowest arrowhead extends slightly past left stand of N. Rust lump attached to top of second T at center."